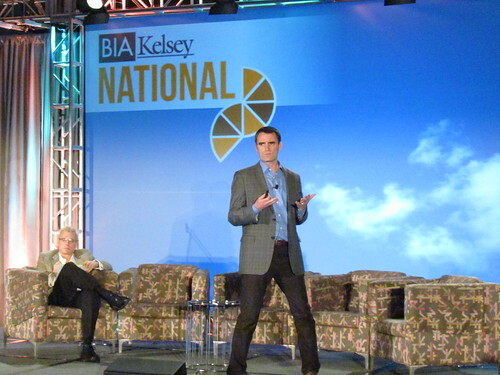 Video is now available for purchase from the third and most evolved edition of BIA/Kelsey NATIONAL, which took place March 25-27 in Dallas. At the show, we saw that industry leaders were in general agreement that major progress has been made among all the stakeholders in “national marketing, local targeting.” Many speed bumps, however, are still being felt along the way. Key stakeholders, including agencies, media companies, franchises and local franchisees are, by necessity, transforming their identifies as they adjust to the new digital (and mobile) marketplace. 1. The time is finally ripe for National Local. Research by the CMO Council — cited by BizHive’s Dave Walker — noted that 57% of CMOs say that local programs are important, but only 7% of CMOs have a successful program in place. Success, however, will soon become more apparent. 2. Media and directory companies are transitioning to the new environment. Local newspapers and directories still play a real role in targeting locally — and regionally. But they are also being forced to re-evaluate their core strengths. It is a simple admission to note that many advertisers really aren’t getting ROI from the traditional products, notes Robyn Rose. But they can reposition themselves by providing consultative services with their advertisers. “You really have to understand your partners. If you are targeting local or franchise locations, for instance, you need vertical and regional experts,” she says. Mike Orren notes that media companies are well positioned to guide and sell local businesses and even national business in their market. But they can’t get “hung up” over moving their own inventory. Their core assets are not their product, but their “brand, reputation and feet on the street,” he says. Gregg Stewart says that the key thing is that media companies are now being judged entirely on their effectiveness. “At the end of the day, the advertiser doesn’t care if (the media is) local or not. They want to sell something. They will look at whatever they can buy that is fastest and cheapest,” he says. 3. Some things are automated, and some things are not. Relying solely on automation and “air coverage” doesn’t work at every level, especially in local. “There is a paradox in local,” says Gregg Stewart. Marketers build their attack the CMO level. Programmatic sales and other automation are highly effective for doing that, he says. But you need to also execute work with door to door sales. “Companies need to understand the partnership with sales and marketing,” adds Warren Kay. They must ultimately collaborate to leverage customer insights and customize aspects of the marketing campaign. Companies such as Simpli.fi, for instance, do very well in developing content marketing programs to complement their programmatic sales. 4. Platforms can bring local franchisees in line, and also liberate them. Brands are “schizophrenic” from top to bottom, with the national brand representing one thing, and each local outlet representing something else. The question is to what degree is it healthy to have “local franchisee stars act like franchise choir boys” — as Yext’s Christian Ward put it.